By reading to a therapy dog, children are able to improve their reading skills in a unique and fun environment, where they forget their limitations and develop a “can-do” attitude. The goal of the L.E.A.P. 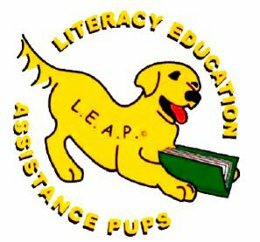 program is to improve the literacy skills of children, and grow their enthusiasm for reading, through the assistance of therapy dogs as literacy mentors. The presence of a L.E.A.P. dog creates an inviting and motivating reading environment. Specifically, a L.E.A.P. dog is nonjudgmental, comfortable, and fun!